Thoughts on last weeks game against Air Force? A gutsy come-from-behind victory after Wyoming lost its starting quarterback and running back on the first series of the game, and the defense not being able to stop Air Force for three-and-a-half quarters. Some are saying this was one of the biggest come backs in school history. There have been bigger in terms of deficits, but this will be one of the more memorable ones. Redshirt freshman quarterback Tyler Vander Waal comes in after losing his starting job a few weeks ago and plays his best game with two touchdown passes and two rushing touchdowns. He converted some key third and fourth downs. A lot of guys came up with clutch efforts in the win, but no one more than Vander Waal. 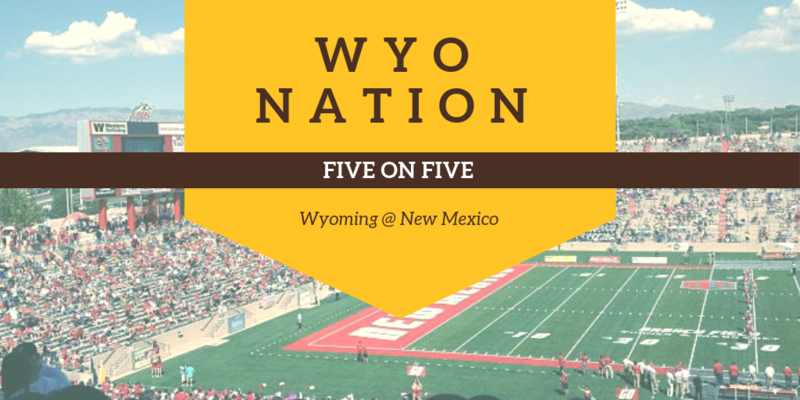 Wyoming’s defense needs to take some chances and make some adjustments to get some key stops. If those risks don’t work, it might be a different conversation. Plays its game with ball control and a good mix of throwing it. The defense can’t allow big plays and also not let New Mexico hang around. The Lobos have lost six straight, but are capable of doing good things. The longer they are in the game, the more dangerous they are. Can’t remember the last time I covered a game where momentum swung that quickly. Wyoming did virtually nothing without its starting quarterback and starting running back while Air Force gashed the Cowboys’ defense for three and a half quarters. Then Tyler Vander Waal led three scoring drives in 8 minutes, 38 seconds, and the defense held Air Force to 13 yards on its last three possessions. Some things you just can’t explain, and that comeback is one of them. Tyler Vander Waal. Not taking a snap in nearly a month and facing a 13-point deficit with half a quarter to go in the snow? Apparently that’s no problem for Vander Waal, who ran for a fourth-quarter touchdown and threw the go-ahead score as part of a career-high 225 yards passing. It was a feel-good moment for a guy that’s taken his share of criticism this season. Tyree Mayfield. With Nico Evans doubtful at best, I’m going with Mayfield, who’s quietly had his best season in a Wyoming uniform. He leads all of Wyoming’s tight ends in catches and had a pair of long gainers a week ago to set up touchdowns. He’s emerged as a safety valve for the quarterbacks, and I think that will continue Saturday. the Cowboys can protect Vander Waal and win the turnover margin. The way Wyoming used Sean Chambers’ running ability masked the issues Wyoming had protecting Vander Waal the first half of the season. He’s been sacked 21 times. The Cowboys are going to have to establish some sort of passing game, especially if Evans isn’t able to go, and I think they can if Vander Waal has time to throw. And with the Cowboys’ margin for error being so small, protecting the ball is always a must. The Cowboys showed a lot of resilience last week by coming back and beating Air Force after being down 13 points in the fourth quarter. The Cowboys could have easily folded when Sean Chambers and Nico Evans went out, instead it was next man up and kept after a win. The Cowboys’ season would have ended last weekend had the team folded. Instead they’ll keep fighting for a spot in the FBS post season. Good win, good momentum headed into the season finale. Solid game from a quarterback who didn’t give up on the season. He could have easily been resentful from being benched earlier in the season, instead he kept his head in the playbook, as well as the game, and led the Cowboys to a win. Nico Evans is listed as doubtful for Saturday’s game against New Mexico, and unknown of Jevan Bigelow will be ready to go. I’ll go with the guy who put the exclamation point on the Cowboy win over Air Force. Keeping drives alive will be important. Wyoming wins if Tyler Vander Waal has a game like he did last weekend. He needs to be able to keep the ball moving through the air and not be the cause of turnovers. The Cowboy defense seems to be up to the task if shutting opponents down lately, now it’s on the offense to keep them off the field and score enough points. The Cowboys are by no means an offensive juggernaut this season, but they need to be good enough to beat New Mexico. The defense stepped up when they had to late in the game but Tyler Wander Waal has to be the MVP coming in for the injured Sean Chambers and passing for 2 TDS and doing his best Chambers impression with 2 more TDs with his feet. Wyoming’s spirit animal Andrew Wingard will have a day in his last regular season game as a Poke. They can run the ball. New Mexico has the 9th ranked rush defense and the bottom three schools Wyoming has already played put up 157, 291 and 424 yards against those defenses. Nico Evans and Jevon Bigelow may or may night play so Poke fans should keep their eyes on the injury report. I thought it was exciting, obviously. One hell of a comeback by the Cowboys. Bowl hopes are still alive with one to go. Who else could it be? The Mountain West player of the week stepped up when he was most needed and made huge plays in the 4th quarter. With Nico Evans listed as questionable and no Sean Chambers, TVW needs to make some big time plays once again. They win the turnover battle and don’t get down early. The key to success will be getting up early and controlling the clock.